Christian communities in the East Kilbride area go back a long way. The first chapel was established as far back as the twelfth century. Here we present a brief timeline of the evolution of the church in East Kilbride, from the time of King Malcolm IV in 1180, to Bishop Scanlan helping to lay the foundation for the present St Bride’s. From “light cannons” to the imposing brick mass, our Grade A listed building often polarises opinion. 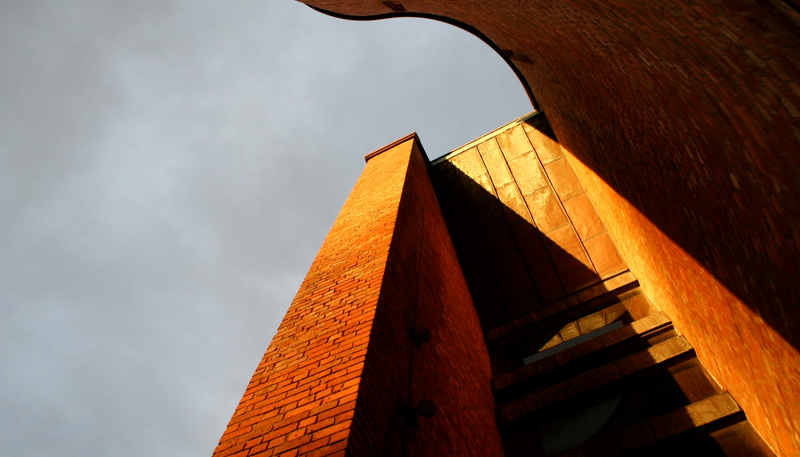 It is, nevertheless, regarded as one of the finest examples of British twentieth century ecclesiastical architecture. A building of which we can be rightly proud. Welcome to St. Brides, East Kilbride. Our aim is to be a vibrant Roman Catholic Christian Community, located as we are in West Central Scotland, and to play a part in the mission of the Church in the modern world: to re-evangelise the nations and transform society through her preaching of the Good News of Jesus Christ. Here is the special edition of the Whitemoss Chronicles, published to mark Canon Ryan’s Golden Jubilee in 2009. The photographs from the Golden Jubilee Mass and Reception on Sunday 8th June, 2014, are still available. The complete set of photos can be viewed and prints purchased here. Please note that these are the times at which Services are normally held. They may be changed according to circumstances. For up-to-date information please refer to the weekly Bulletins.